For more information on spectrum and the GSMA iniciatives, please contact Lucas Gallito. Radioelectric spectrum is the means whereby electromagnetic waves frequencies used for mobile telephone services are transmitted and, as such, is vital for the development of the mobile ecosystem. The larger the assigned spectrum, the more bandwidth is available to each user. This scarse but renewable resource is regulated and managed by the Government in each country. Over the last six years, mobile operators in Latin America have invested more than USD $11.2 billion in the acquisition of new spectrum. To date, the average allocated spectrum per country in the region is 319 MHz, 43 per cent more than in 2012.This increase results from the licensing of the so-called “4G spectrum bands” (AWS 1700-2100 MHz, 2.6 GHz and 700 MHz) across the region. Over the past few years, mobile users have consistently increased their demand for data. According to Ericsson, traffic has quadrupled since 2010 and consumption per user is expected to grow from 1.2 GB to 6 GB per month in 2021, as a result of the almost 400 million connected citizens in the region (more than 50 per cent of the Latin American population, according to GSMA Intelligence) who are consuming more data per user. In Latin America, internet access is mostly mobile (and prepaid), with 4 mobile and 1 fixed broadband connection for every 5 internet connections.GSMA estimates that an additional 600 to 800 additional MHz will be required to meet this growing data demand, depending on each country’s characteristics (“Data Demand Explained” GSMA, 2015″). The potential of creating a high impact on society as a whole makes spectrum extremely valuable. Some practices tend to maximize it while others tend to delay the positive effects it may have on the community. Each additional obligation in spectrum licensing has tangible consequences: a 50 per cent increase variation in spectrum price can result in a 62 per cent reduction in project value.Additionally, high spectrum prices may reduce investment capacity or delay the roll out and adoption of mobile internet, while macroeconomic conditions and regulatory predictability can heavily influence risk assessments on investment.Moreover, short-term licenses (5 or 10 years) do not allow enough time for investment recovery return within the stipulated time, and affect the participation of potential bidders in the licensing processes as well as their investment levels. Each additional obligation in licensing terms and conditions results in higher service costs, which typically lead to price increases to users. Regulators who manage spectrum efficiently take specific local conditions into consideration and communicate their intentions with operators with sufficient advance notice, thus providing the necessary predictability.They also typically establish less obligations, making the process more affordable and achievable for operators.Additionally, these regulators tend to encourage spectrum management flexibility by implementing a technology-neutral approach and reducing delays as much as possible. For more information, see “Key considerations in mobile spectrum licensing”, OVUM February 2015. Certainty regarding the general regulatory framework and license renewal terms is key to promoting the large investments required for the roll out and maintenance of mobile networks. A study commissioned by GSMA to BlueNote Consulting emphasizes that the lack of certainty with respect to license renewal could result in a 49 per cent to 83 per cent potential investment loss given the increased risk of non-renewal. If certainty regarding license renewal options is available, incumbent operators can maintain their planned investments as well as anticipate other infrastructure and network deployment investments before the license renewal dates.Most countries in the region offer 15 to 20-year terms licenses, with 17 years being the regional average. For more information, see “License Renewal in Latin America”, Bluenote Management Consulting, February 2014. 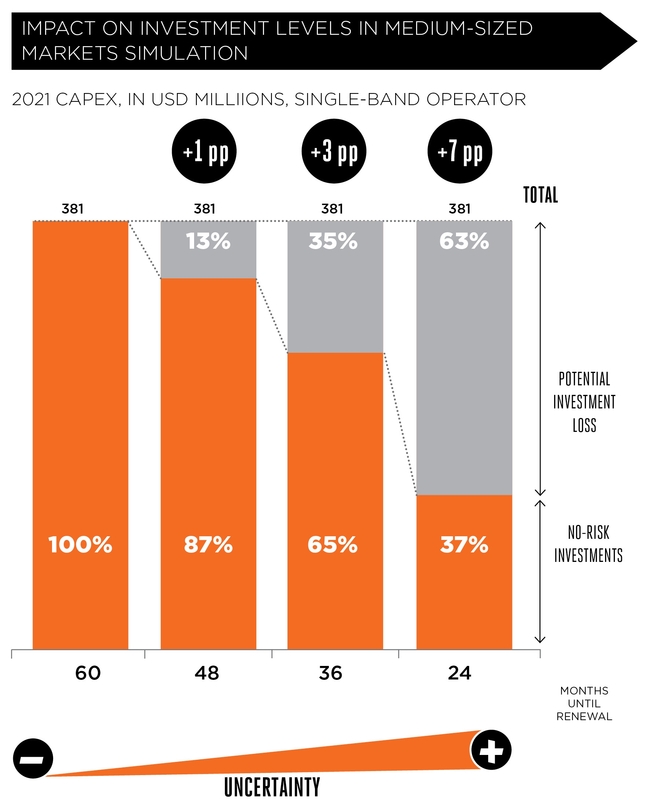 The Digital Dividend is the upper segment of the UHF band, 700 MHz —in the case of Latin America—traditionally used by broadcasting services in most countries. As a result of the transition from analogue to digital television, this band will be vacated and could be reassigned to mobile services, specifically mobile internet.This will allow the allocation of more capacity to make it easier for mobile services to meet the data traffic growth and increased network coverage demands (both in suburban and rural areas and within homes and buildings). If the Digital Dividend were assigned to mobile operators in Latin America, USD $14.2 billion would be contributed to regional GDP, in addition to new jobs, greater tax revenues and a service coverage increase of up to 93 per cent of the population. The band known as AWS falls in the 1700 and 2100MHz frequency. Given its higher data transmission capacity, the allocation of AWS benefits all users by helping mobile operators meet the demands for data and quality of service improvement. One of the remarkable features of AWS is the possibility of aggregating both HSPA and LTE in this band, which can be used in most countries in the Americas.By fostering economies of scale, the region can enjoy even greater economic benefits. Licensing the AWS band to mobile technology will represent an additional $53 billion in those countries where this band has not been assigned yet. High-frequency bands, such as the 2.6GHz band, have a higher coverage cost but they are more appropriate for providing capacity required to meet the demands for high-speed data transmissions from large numbers of users in urban areas, airports and other crowded places. This band can be used for mobile broadband in the same way around the globe, fostering economies of scale that will benefit equipment manufacturers worldwide and, consequently, reducing device and network infrastructure costs.This band could potentially become the common worldwide band for commercial mobile broadband services. For more information about the new spectrum bands, which were agreed at the World Radiocommunication Conference in 2015, click here. These bands will support the evolution of mobile broadband services in Latin America and therefore affect the wealth, well-being and future perspectives of all countries and their citizens.